Newly discovered world orbits twin suns, just like the fictional home of Luke and Anakin Skywalker. Astronomers on Sept. 15, 2011, announced the discovery of Kepler-16b, the first alien planet with two suns. The planet sees two sunsets just like Luke Skywalker did on Tatooine in the "Star Wars" science fiction universe. 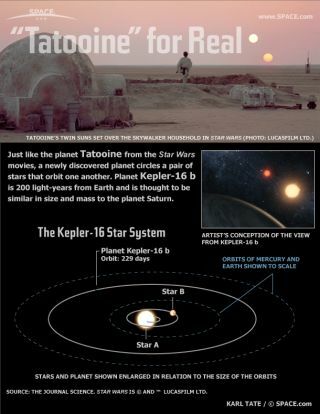 See how the twin suns are set up around the planet Kepler-16b in this SPACE.com infographic. What Would Earth Be Like with Two Suns?